A charity in Blue Springs focused on first responders helped buy the Lee's Summit Police Department's first drone. The $5,000 drone will help document crime scenes, map crashes sites, and conduct search-and-rescues. LEE'S SUMMIT, Mo. 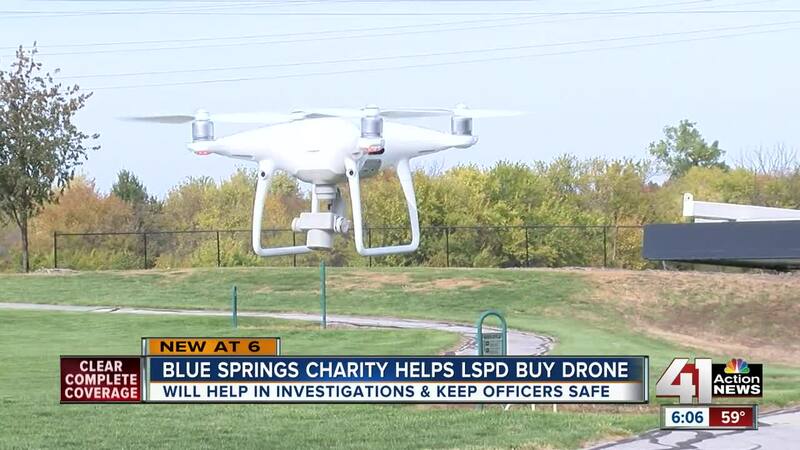 — A charity in Blue Springs, HeroFundUSA , focused on first responders helped buy the Lee's Summit Police Department's first drone. The $5,000 drone will help document crime scenes, map crashes sites, and conduct search-and-rescues. "Last night, we got a call from one of the sergeants that they wanted to try and located a man who was suicidal under one of the shelters at one of the parks," LSPD Public Information Officer Sgt. Chris Depue said. "It's a large wooded area, a large area to search. The drone can help us shrink that size down and search that area quickly, and it's safer than doing it on foot with human beings." Lee's Summit police now join a growing trend. Law enforcement agencies make up two-thirds of the more 900 first-responder agencies in the United States that currently using a drone, according to a study released in May from Bard College in New York. "This is our first partnership on a high-tech piece of equipment," HeroFundUSA CEO Darrell Smith said. During the last two years, the Blue Springs-based charity hasn't turned down a request. "We would much rather hear about a drone getting shot down or injured or crashed on the nightly news as opposed to a first responder, so that's our mission is to keep first responders safe," Smith said. Currently, two Lee's Summit officers, including Depue, are licensed drone operators, but the department is training additional operators and hopes to have seven people in the unit. "What this does, it lets us get into the world of aviation," Depue said. "There's an entirely different perspective up there without having to make that huge investment that no one can really afford in aviation."